Tug waves are caught in deep water offshore, unlike freighter waves which break near the beach. Waves can vary from waist to chest high and go a half mile or longer depending on the type of board or kayak you’re using, your surfing skills, and weather conditions. On a big day we can choose a smallish waist high wave or go for the big drop depending on your skill level. What’s the difference between freighter vs. tug waves? Freighter wave season is Spring to early Fall due to low tides which help the waves break. These waves break on the beach like standard ocean waves and session from one boat can last up to an hour. The boat is long gone by the time the wave arrives. The Inertia story on Tug Surfing. Canoe Kayak Magazine story on Tug Wave Surfing. See my YouTube page of Seattle tug surfing videos. How and when to catch similar other boat waves on Puget Sound. Receive a 3 page manual on where and how to surf tug waves on Puget Sound. We’ll shoot video or stills of your experience. Intermediate to advanced paddlers who are comfortable paddling on open water with previous surfing experience. Tug waves are harder to catch than freighter waves and require more skill. We catch these waves a half mile offshore and rides can last as long as a half mile on a good day. 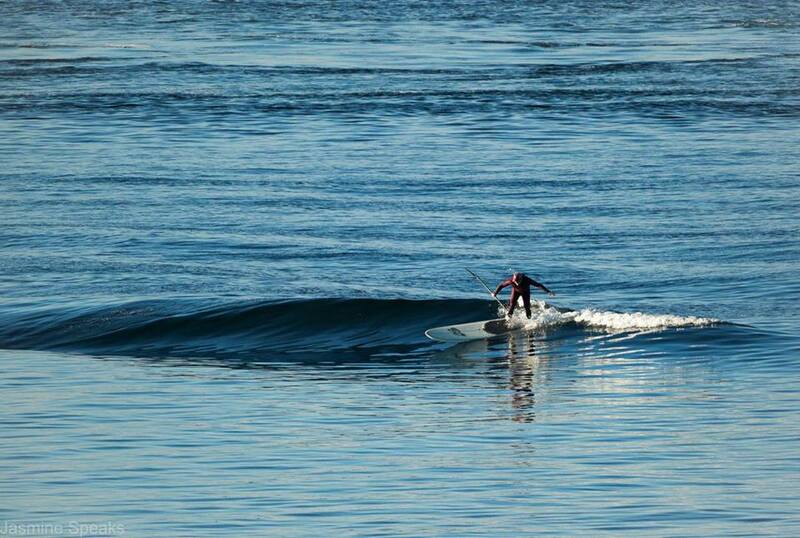 Racing or downwinding Sups as well as OC’s, sea kayaks and surf ski’s are best to catch these deep water waves. Must be able to paddle 3-4 miles with ease in rough conditions. We can’t guarantee waves. Tug waves can be fickle. On no wave days I’ll teach you the strokes we commonly use in surfing or bombproof your current skills. Three core strokes will increase your wave count both here and on the coast. We’ll cover self-rescue, water safety and rescues for rough water conditions and where to find and how to forecast tug and freighter waves. We offer one free followup class for students who don’t catch a wave during their first class. Bringing You Own Gear? Displacement boards work best on these waves 12-6 to Unlimited lengths. I have available for use a 14′ Imagine Connector (29″), Splinter SUP 16’x28″ and two UL boards, 17′ and 18′. Dress for immersion, bring a coiled leash, vest PFD ideally, gloves, hood and booties if you get cold and hydration. Try on your wetsuit before arriving. Group Rate: 199 per person. 2 – 4 students. Rental gear free with class cost / 173 with your own gear. Individual Rate (1-1): 299 with our gear. Rental gear free with class cost / 279 with your own gear. Repeat Classes: $25 off per person. If you didn’t get a wave your first class – come out again for free.